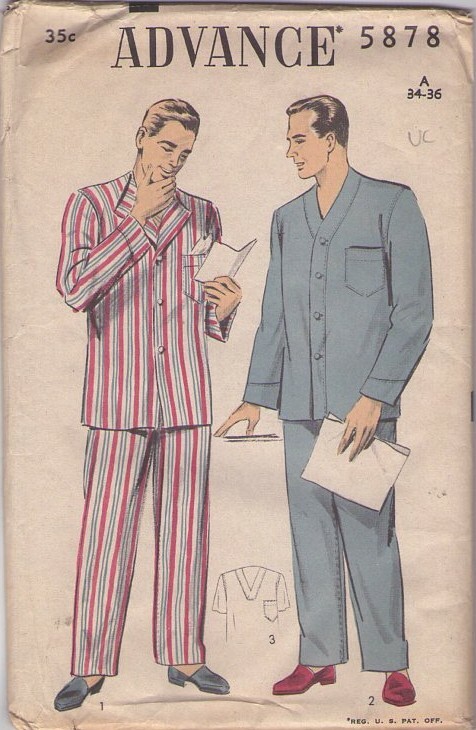 1951, 50s Menswear, Retro Sleepwear Clothing Patterns - GRAND Classic styled men's pajamas features two pullover top, view 1 with rever neckline, long sleeves; view 2 with band front, long sleeves. Trousers have drawstring or hammer on snaps to close. CONDITION: This Original Vintage Sewing Pattern is unprinted and is unused. All pieces appear to be complete and intact and have been neatly refolded with the original instructions.